Eileen Crimmins, Reginald Tucker-Seeley and Caleb Finch are included in a new faculty recognition display of scholarly works at the Amy King Dundon-Berchtold University Club of USC. 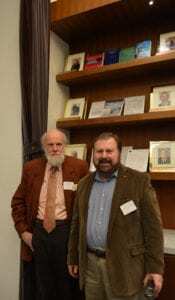 University Professor Caleb Finch and Distinguished Professor Kelvin Davies in front of the Leonard Davis School displays at the USC University Club. Three celebrated USC Leonard Davis School of Gerontology faculty members have been honored with a display of their scholarly works. The Amy King Dundon-Berchtold University Club of USC holds the display. The Faculty Recognition display in the Carnegie Room of the University Club includes portraits, books, and manuscripts from University Professor and AARP Professor of Gerontology Eileen Crimmins, Edward Schneider Assistant Professor of Gerontology Reginald Tucker-Seeley and University Professor and ARCO/William F. Kieschnick Professor of the Neurobiology of Aging Caleb Finch. Distinguished Professor and USC Leonard Davis Vice Dean Kelvin Davies introduced the honorees. He said the three gerontology honorees include the USC Leonard Davis School’s first faculty member and a recipient of most of the major awards in biomedical gerontology [Finch], USC’s first female faculty member elected to the National Academy of Sciences [Crimmins], and a rising star in health and social policy research who recently finished a Robert Wood Johnson Foundation Health Policy Fellowship in Senator Dianne Feinstein’s (D-Calif.) office in Washington, D.C. [Tucker-Seeley]. The honorees are 20 USC faculty members whose scholarly works are significant contributions to their respective fields. Their academic deans nominated them through an open call and selected by the University Club’s Board of Councilors. Among the featured works displayed are books, cover articles, artwork, artifacts, and prototypes produced by these USC contributors. This inaugural class includes twenty scholars from five participating USC schools and the Dornsife College of Letters, Arts and Sciences. Top (L-R): Kelvin Davies, Caleb Finch, and Reginald Tucker-Seeley (not present: Eileen Crimmins).